Active-8! 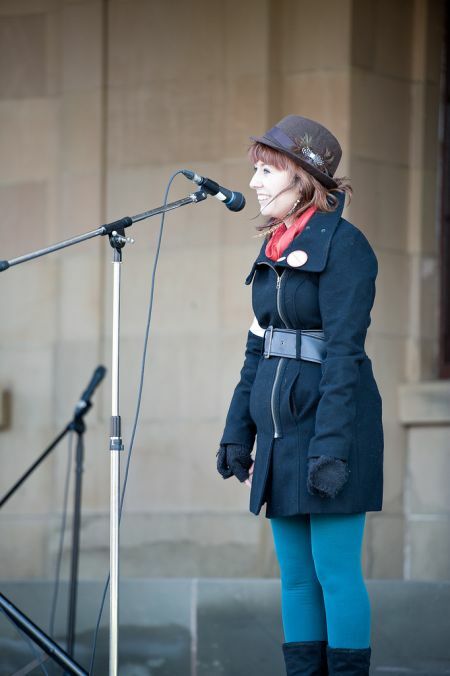 youth leadership award recipient Kandace Hagen speaking at the November 2011 reproductive rights rally in Charlottetown (Patrick Callbeck photo). 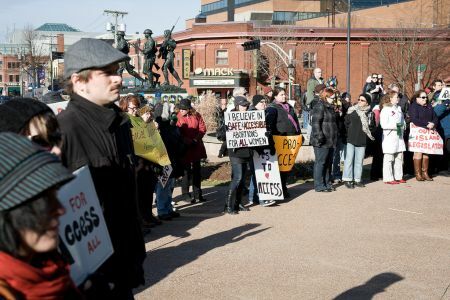 PEI's first demonstration in support of reproductive rights in over 20 years took place November 2011 in Charlottetown (Patrick Callbeck photo). Anti-abortion activists counter-demonstrated in comparable numbers at the November 2011 reproductive rights rally in Charlottetown (Patrick Callbeck photo). Kandace Hagen expected her nomination for a youth social justice award to be slightly controversial. After all, if she won, she would be recognized for her work advocating for abortion access in Prince Edward Island. She didn’t, however, expect to face a campaign by anti-abortion activists trying to ensure she didn’t win. The Atlantic Council for Cooperation’s Active8! campaign highlights eight youth, and awards one, who have demonstrated outstanding leadership for social justice. The leading contestant, Tara Brinston, was entered into the campaign in recognition of her advocacy work for the rights of people with disabilities, but ended up alongside Hagen in the middle of an abortion access debate. Hagen, 24, has been part of a reinvigorated movement to get access to abortion services on PEI, and to increase women’s access to information about their reproductive options. PEI is the only province in Canada without any abortion services offered within its borders. This is despite the fact that since 1988, the Supreme Court has interpreted the Canadian Charter of Rights and Freedoms’ guarantee of the “security of the person” as protecting women’s access to abortion services. While this removed legal barriers to abortion, the majority of public hospitals across Canada do not offer abortion services. Currently, a PEI woman seeking an abortion would have to travel off Island. She could pay around $800 to the private Morgentaler Clinic in Fredericton, NB, or access a PEI-funded abortion at the Halifax General Hospital after a referral from her doctor. Either way, she pays her own travel costs. If she were in her second trimester, she would have to travel to Ottawa or Montreal, covering medical and all other costs as well. “She” could have been Hagen. When Hagen sought the procedure two years ago, her doctor only informed her of the private option in Fredericton. The clinic, in turn, advised her to wait two weeks out of uncertainty that she would be past the necessary eight-week mark. It was in large part due to this experience that Hagen helped launch the PEI Reproductive Rights Organization (PRRO). The group raises awareness on what options already exist for women on PEI, and how these compare to the rest of Canada. “A lot of people were very surprised. Some had no idea that there were no abortion services available on PEI. Others were equally surprised that there was any funding at all,” says Hagen. 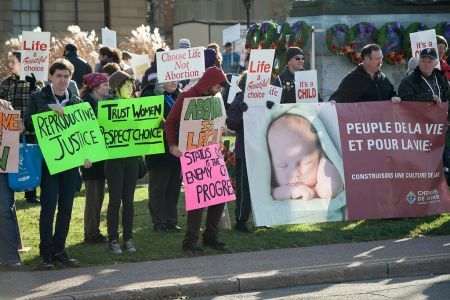 Bronwyn Rodd, another founding member of PRRO, sees a particularly strong “culture of silence” on PEI surrounding abortions — a culture that extends well into the medical community. PRRO sent a survey to every doctor in the province, with detailed information about current abortion service options. Many doctors responded stating that they are pro-choice; however none would be willing to take a public pro-choice stance. So far, the group has found one doctor from off Island willing to provide abortions on PEI. “One doctor anonymously spoke to the media here, saying he would be in favour of providing the service, but he would be afraid of retribution by the pro-life people. They are very active. PEI is so small and confidentiality is a challenge,” says Rodd. Anti-abortion activists on PEI refer to their province as Canada’s ‘life sanctuary.’ In other words, “the only place without any legal access to abortion,” says Rodd. “[PEI] is very high on the priority list for the national pro-life movement, because we are sort of their ‘in’ for regressing [abortion] laws in general.” She believes local anti-abortion groups receive substantial financial support from their counterparts across North America. A spokesperson for one such group, PEI Right to Life Association, urged people to intervene in the Active8! campaign. Similar activists turned up in equal numbers to counter-demonstrate at PRRO’s 300-person protest last fall, the first pro-choice rally in the province in 20 years. The association also published a full page ad in PEI’s main newspaper, The Guardian, in which the group purports to clarify “a number of errors that can be confusing and present a false basis upon which to view the abortion issue on PEI.” The ad’s highlighted “errors” paint a picture in which PEI is in fact enshrining the Charter of Rights and Freedoms, rather than transgressing it as the country’s black sheep. The PEI Reproductive Rights Organization (PRRO), is currently seeking support from feminists and allies across Canada to support the legal costs of launching their potential lawsuit. To find out more about PRRO you can visit prro.tk. Peter Driftmier is a producer and collective member of Redeye on Vancouver Co-operative Radio, and a community organizer. He spends his mornings trying to convince elementary students at a Downtown Eastside breakfast program of the virtues of tofu, wholegrain bread, fruit and veggies.